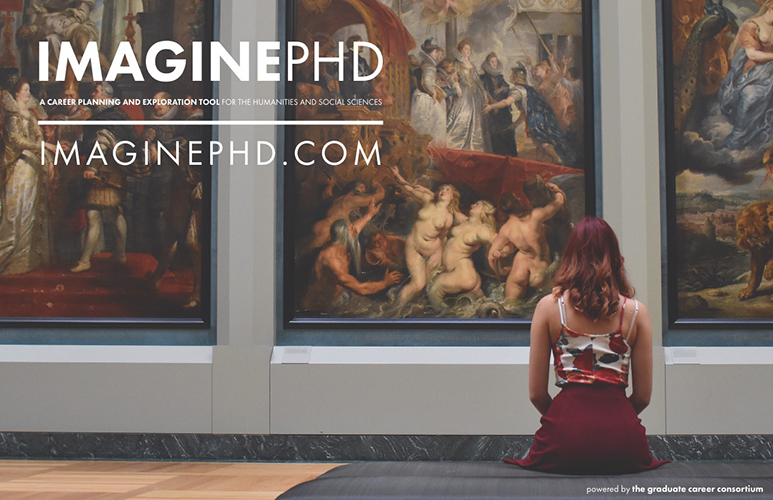 ImaginePhD is an online career exploration and planning tool for PhD students and postdoctoral scholars in the humanities and social sciences. Humanities and social sciences PhD students and their mentors have long recognized the need for more resources to help bridge the knowledge gap between doctoral education and the realm of career possibilities. ImaginePhD is designed to meet this need by allowing users to assess their career-related skills, interests, and values and to explore careers appropriate to their disciplines. The tool includes a goal setting application that enables users to map out next steps for career and professional development to achieve their goals. What are the components of the ImaginePhD website? And what does each do? Assessments: Three online assessments allow PhD students to self-assess their career-related skills, interests, and values. Once the assessments are completed, an algorithm allows users to compare their skills and interests alignments with Job Families. Job Families: PhD students and postdoctoral scholars can explore potential careers by reviewing the Job Families component of the website. Sixteen job families relevant to the humanities and social sciences are contained on this page. Each job family contains detailed information about types of careers and resources to help PhD students explore, connect, build skills, and apply for positions. Sample career packets with job descriptions, cover letters, and resume examples are also contained in this section. My Plan: The My Plan component of the website provides PhD students and postdoctoral scholars with the opportunity to create an individual development plan (IDP) and set specific, measurable, achievable, realistic and time-based goals that will help them advance in their graduate programs and careers. My Plan also provides the opportunity for mentors and PhD students to “check-in” and agree upon the next steps in completing PhD and postdoc milestones. Who is behind this effort and what expertise do they bring to the project? 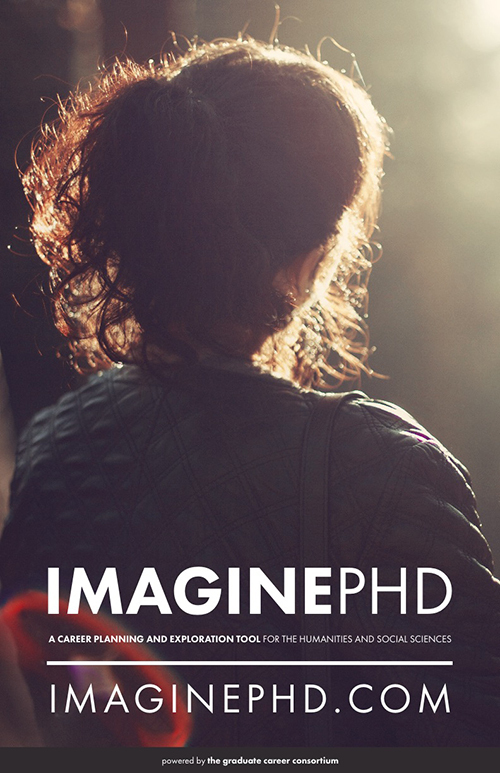 ImaginePhD was created by an ad hoc committee under the auspices of the Graduate Career Consortium – a professional organization of university administrators leading the career and professional development efforts for doctoral candidates and postdoctoral scholars at their universities. Many GCC members themselves are PhDs from the humanities and social sciences, as well as, STEM fields. For this effort, over 80 individuals from 56 universities and institutions in the U.S. and Canada are currently involved or have been part of the development of ImaginePhD. To ensure that ImaginePhD meets the needs of humanities and social sciences PhDs, focus groups with graduate students and faculty members are being held nationwide, and feedback continues to be incorporated into the tool. What are some of the expected outcomes and value added of using ImaginePhD at my institution? Provide self-assessment resources to assist PhD students and their mentors in identifying careers that align with their career-related skills, interests, and values. Enhance career exploration opportunities for PhD students and postdoctoral scholars in the humanities and social sciences – populations that may receive less attention at STEM-focused institutions. Introduce PhD students and their mentors to the concept and value of creating individual development plans – both to enhance success in graduate school and future career aspirations. Demonstrate support for, and understand the value of, all career paths. Broaden the discussion of the intrinsic value of the PhD in the humanities and social sciences at institutions that support the ImaginePhD project. I am a faculty mentor/advisor to PhD students in the humanities or the social sciences. How will ImaginePhD benefit my students and help me be a better mentor? Not all PhD faculty mentors/advisors have equal access to information about the broad array of career opportunities available to their PhD students. ImaginePhD seeks to bridge this knowledge gap by providing humanities and social sciences-specific career information. Exploring career pathways early can help your students create a comprehensive plan for their PhD. Even if your students entered the PhD program with a specific career path in mind, understanding oneself is important to all job searches. Your students can use ImaginePhD to identify skill gaps in communication, networking, leadership, etc. and create plans to build additional learning experiences into their graduate education. Early identification of careers helps your students identify “transferrable” topics or research methods for their research. This helps them contextualize their research and its value beyond the academic realm. Finally, Individual Development Plans (IDPs) create opportunities for students and mentors/advisors to “check in” and offer a means for benchmarking. An IDP can help you and your students set goals and map out next steps for successfully completing PhD milestones and exploring career pathways. I am a PhD student or postdoctoral scholar in the humanities or the social sciences. How will ImaginePhD benefit me? Even if you entered your PhD program with a particular career path in mind, understanding oneself is important for all job searches. 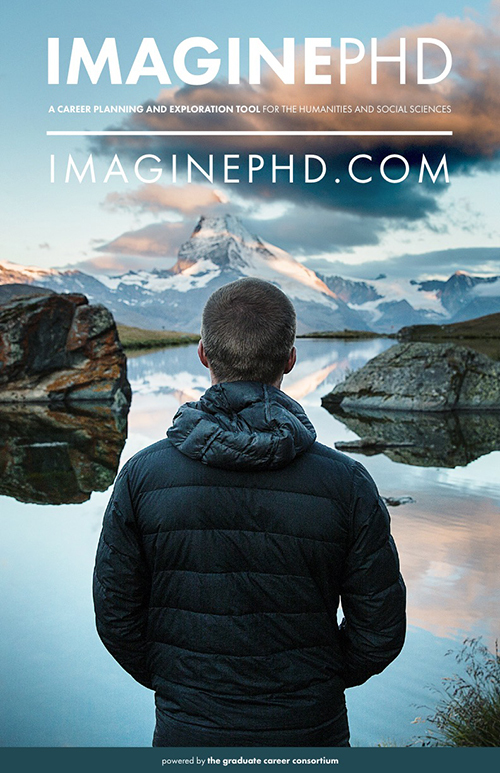 ImaginePhD provides career-related skills, interests, and values assessments to enhance your self- knowledge. ImaginePhD helps you identify a variety of career pathways early so you can uncover opportunities. Doctoral education does not always include information about these opportunities and ImaginePhD seeks to bridge this knowledge gap. Early identification of careers can help you to identify “transferrable” topics or research methods for your research. ImaginePhD enables you to identify skills gaps in communication, networking, leadership, etc. while you are still a student so you can build additional learning experiences into your planning. Finally, creating an individual development plan (IDP) can help you map out your next steps not only for your career, but to achieve the milestones of your PhD program and successfully complete it. What does it cost to use ImaginePhD? 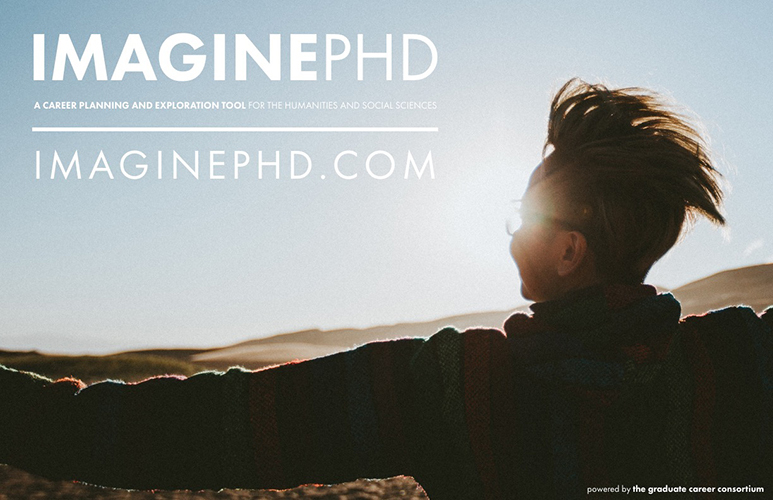 ImaginePhD is free to all users. If ImaginePhD is free, how is the project funded? 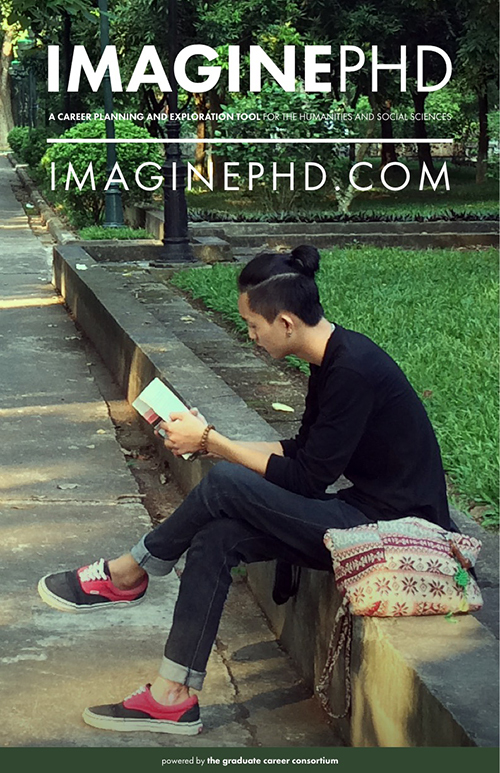 The ImaginePhD project relies on contributions from institutions of higher education and professional societies concerned about the career well-being of PhDs in the humanities and social sciences. Graduate Career Consortium members have contributed countless volunteer hours researching and developing content and conducting outreach in support of this ground- breaking project. Early in the process, members agreed that they would contribute their time and talent to build ImaginePhD and make it freely available to all graduate students and postdoctoral scholars and their mentors. As part of that agreement, ImaginePhD committee members continue to seek funding in support of the project. Our initial sponsors have allowed us to build the online tool, but given our ambitious plans we seek additional support to ensure that the content will be continuously updated and adapted to changing needs. My institution/organization would like to support the career development of humanities and social sciences PhDs through this project. What types of sponsorship are available? All sponsors at the Bronze level and above will have their institution’s logo featured on the Sponsors page of the ImaginePhD site for the lifetime of this project. Institutions that contribute at the Silver level and above will receive an annual report containing aggregated data on the demographic information and number of users from their institution for three years. Sponsors may choose to donate in a single payment or over a period of years to reach a desired level of sponsorship. All donations are greatly appreciated. What steps were taken to ensure that Imagine PhD is and will continue to be a sound and robust tool that is appropriate for use with humanists and social scientists? With over 200 members at research institutions across the U.S. and Canada, the Graduate Career Consortium has ready access to experts who will continue to use and evaluate the site. In addition, the User Experience subcommittee conducts focus groups to gather feedback to further refine and improve the tool. We are confident that our membership, as well as the users themselves, will continue to provide feedback to enhance the project. We will use this feedback to continually update and upgrade the site to meet the needs of our users. What process was used to create the ImaginePhD assessments? Following a similar process that resulted in the creation of the myIDP online career tool for STEM fields, the ImaginePhD team engaged “experts” to complete surveys to gather data to match skills and interests to sixteen job families. To determine the appropriate experts sample size and make-up, Professor Fred Oswald, PhD, Industrial/Organizational Psychology, Rice University, was consulted. Based on his recommendations, the ImaginePhD team identified 30 experts whose qualifications included having been in their role for 5 years or more, having experience providing career advising to PhDs in the humanities and social sciences for a broad array of careers, or were members of appropriate professional societies or organizations, or were themselves PhDs from the humanities or social sciences in a variety of careers. The experts were provided a description of sixteen Job Families and asked to rate a list of skills and interests on a Likert scale of 1 to 5 in relationship to these job families. For skills assessment, experts were asked to rate how important each skill is for success in the particular job family (where 1 = not important at all and 5 = extremely important). For interests, experts were asked to rate how likely each interest would be satisfied or fulfilled by work each of the job families (where 1 = unlikely interest would be satisfied to 5= highly likely interest would be satisfied). These data provide the basis for the algorithm which maps self-reported skills and interests to job families. Who manages funding for this project? The Graduate Career Consortium (GCC) will oversee the management funds for the ImaginePhD project. The GCC is a not-for-profit corporation incorporated under the laws of the State of Florida and is operated exclusively for charitable, literary, and education purposes within the meaning of Section 501(c)(3) of the Internal Revenue Code of 1986. If I have additional questions about the ImaginePhD project, who should I contact? Where can I download ImaginePhD promotional material? We've made several resources listed below for you to use. If you have specific questions, please contact ImaginePhD project lead, Teresa Dillinger, tdillinger@imaginephd.com. Refer to the ImaginePhD online style guide for information on our official logo, color palette, typography and more. Easy-to-use templates and images for social media use and announcements to students and faculty. Download & display the following posters wherever you think students will see them.